Pakistan’s folk culture is a living tradition practiced by a dominant majority of its people. Pakistanis, therefore do not have to go looking for folklore, it is all over. In fact, it is so common place that an average rural Pakistani may have no awareness whatsoever of his folkloric culture and the richness of his folk heritage, just like a fish in water. Lahore – the heart of Pakistan is known for its built heritage – historic buildings and splendid structures. For centuries the successive regimes have been enriching the city with love and determination. The construction of each successive era; Mughal, Victorian and the modern, has added tremendously to the grandeur of the city. Shalimar Interchange is a useful addition in the landmark constructions of the metropolis. Constructed on the road to historic Shalimar Gardens, it is a link with our rich heritage and continuation of the artistic vision and the superb building skills that our master craftsmen possess. Shalimar Interchange is a state of the art project constructed by Frontier Works Organisation – the leading construction organisation of the country. It is the first 3 level interchange in Punjab over the canal and the railway line and comprises of a 1.6 km Flyover, 2 Underpasses, 2 Ground Level Bridges and 11 km service roads around the site. The flyover-bridge is of the latest design that is most suitable for the locality. Its sleek transoms (pillars) and girders radiate openness. Besides regulating the traffic at a previous chokepoint, it will provide maximum utility for the residents by uplifting the whole area, says Khwaja Ahmed Hassan, Chairman Task Force Lahore Road Rehablitation Project, I). Concept of shifting to mud architecture is creating waves in Pakistan. It is heartening to know that a lot is happening to convert this concept in to a reality in the form of proposed Mud Village, Peerzada Festival Area, Lahore. Mud is an excellent construction material. It is being used as a building material since prehistoric times. Mud structures can still be found in a variety of climates across the globe; In Pakistan, it is most strongly associated with rural culture. The idea of mud building is now coming to urban areas. Construction of model mud village in Lahore is the case in point. Society for the Promotion of Art and Culture (SPARC), registered in Lahore since 1994, is starting construction of mud village for handicraft men. Prof. Dr. Norbert Pintsch (Senior Expert Service Bonn, Germany) is planning to coordinating the project and giving it a practical shape. Prof. Dr. Norbert Pintsch is an experienced architect by profession is very passionate about mud architecture. Since completing first building project as an architect at the age of 18, Prof Dr Norbert Pintsch has been in various activities as an architect and civil engineer all his life. In addition, Iqbal, a local builder from Harrapa, Ghayyoor Obaid, a local architecture and very interested in mud construction material, Peerzada Festival Area, a concern that is providing space for construction of mud village near world famous Puppetry Museum are also involved in the project. Beacon House University, Department of Architecture and Building Research Institute are also likely to participate. It is not good enough to assume that “everything from the past is good. It is necessary to show,” says Dr. Norbert Pintsch who is very passionate about the project. Like national University in Colombia where students practice construction with local materials like bamboo and wood, the project will give an opportunity to the students of Beacon House University to practice what they have been learning while adapting the construction technique mixed with appropriate technology in Pakistan. A group of amateur photographers with a passion for their homeland have set out to project an image of Pakistan that is totally opposite to the one most popular with international media. Pakistan, today, is in headline news for all the wrong reasons and the world has forgotten that this land still has culture, colors, music, festivals, hopes and aspirations to a brighter future built on a rich past. Members of the Pakistani Photographers Group at Flickr have arranged a collection display of about forty photographs related to “The Other Pakistan” theme. Submitted by amateur members of the group, these amazing captures range from portraits, landscapes, and architecture to everyday life spanning over entire Pakistan including Lahore, the Northern Areas, Cholistan, Skardu and Uch Sharif. After its first successful day (Feb.18), the exhibition will contiue on February 19 at the Students’ Lounge, Lahore University of Management Sciences. The exhibition, sponsored and supported by Bank Alfalah, is to later visit smaller cities of Pakistan as well. Note: Pictures in this post are shared with permission from Mr. Yasir Nasir, photographer and organizer of the exhibition at LUMS and are property of their respective photographers. Ramla Akhtar discovered and wrote this about Churail in the Village. The lives of the residents of this village changed 15 years when a German art teacher took up her student Amjad’s invite and visited his village: Thatta Ghulam da Dheroka. An enterprising spirit, she asked the villagers about their craft. The women showed her hand-made rag dolls. The art teacher, Senta Siller, (and Dr. Norbert Pintsch) told the villagers she could teach them to make refined hand-made dolls. Best thing is that that “Churail” has come to Lahore now. You can visit them at Thatta Kedona, 11/7 — Allaud Din Road, Lahore Cantt, Pakistan. Gaudy! I think not. The houses in this series are a manifestation of the aspirations of their inhabitants. Or at least that’s what I tell myself. Here’s one in Defence. My first reaction was shock. yes, shock is the word that almost defines what i felt for days after reading those books. During my 8 years in corporate sector, I had an opportunity to live and work with people from different parts of the world. I attended training and seminars on issue of workplace diversity and gender issues. Even then this was too big a cultural shock for me to absorb. Can people living in the same city be so different and isolated in their values? Can all of this still be happening in modern times? Questions, questions and more questions I was left with. The adventure boy inside me wanted me to check out the Mohalla first hand. And I did. not once but three times but in none of those trips, I was able to verify the detailed descriptions of the sub-culture as defined in the books. First trip was during day time and second one was in Moharram, so the bazaar was not open and all i saw was just the shops and ordinary people. I was impressed with the architecture of inner city though. In the last trip, I got a glimpse of reality. It was at perfect time. 1 A.M. and I saw the same visuals as described in the books and as you will see in the documentary below. Since, I went alone, I did not dare to enter any of the so called “Office”. Only few friends know what happened that night. This documentary came as a surprise. It verified the contents of the books above and contains real truth about the people who frequent these tawaifs. the interview of the police office in charge is really interesting. This documentary was originally made for TV One but they did not dare to air it. so some one published it on internet. It is a real eye opener. It shows a face of our society, no one even wants mention. Download and save this as PTA might ban these URLs too. as it contains some politically radioactive content. Here is the excerpt from the blog where I originally found the links to these Youtube.com videos. These book can be bought from here or here, both books were published by Oxford University Press and thus they should be available at FerozSons on The MALL. 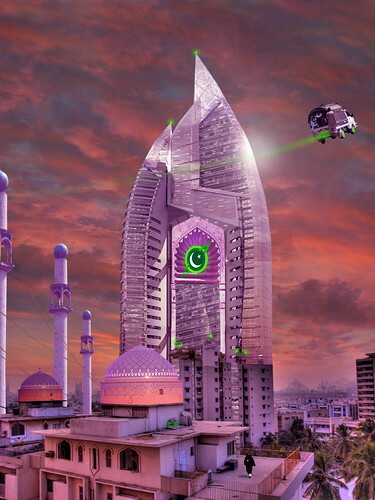 The New Lahore Skycity Pakistani Starfleet Headquarters, originally uploaded by perfectlymadebirds. Kenny Irwin is US based artist, with Pakistani Starfleet Series on Flickr. I really love his love and dedication to Pakistan. Among his art there are lot of Lahore photos of Starfleet. Hope you Enjoy it!! !